I am thrilled to announce the Schwab Foundation's 2017 Social Entrepreneur of the Year Awardees . Social entrepreneurs are people who harness the power of market forces and business principles to solve social problems, from poor health-care to unemployment. However, while creating markets for the underserved has made great strides, the fact remains that governments continue to be the primary provider of social services to the poor. Many of our 2017 awardees partner with governments in a variety of roles: as service providers, demonstrating how programs can be delivered differently; as technical assistance providers, giving public employees new skills, technology, and processes; and even as advocates, helping to craft new laws or policies that have a direct impact on people’s lives. The winners below will join the world’s largest network of mature social enterprises affiliated with The Schwab Foundation for Social Entrepreneurship , the sister organization of the World Economic Forum. Keller Rinaudo, Zipline , Rwanda. Zipline is the first company to use drones - which they call “zips” - to deliver vaccines, medicine and blood transfusions for use in rural Rwanda. A zip zooms along at 100km/hour, dropping off its cargo with a small parachute. Zipline is partnering with the Rwanda government in 20 hospitals and health centres, providing urgent medical supplies for millions of people. Raj Panjabi, Last Mile Health, Liberia/USA . In a remote region of Liberia, 46% of women reported losing a child before the age of five. Last Mile Health has pioneered a Community Health Worker model to reach people living more than 5km from their nearest clinic. In close collaboration with the government, they recruit, trains, equip, manage and pay professionalized Community Health Workers. During the Ebola outbreak, Last Mile Health helped the government to train 1,300 health workers to stop the disease’s spread. Vivek Maru and Sonkita Conteh, Namati , USA/ Sierra Leone . Billions of people live outside the protection of the law. Namati trains and supports local paralegals to help communities uphold their legal rights on three main justice challenges: land and environment, accessing decent healthcare, and citizenship rights. It works in 8 countries, supporting 54,000 clients. 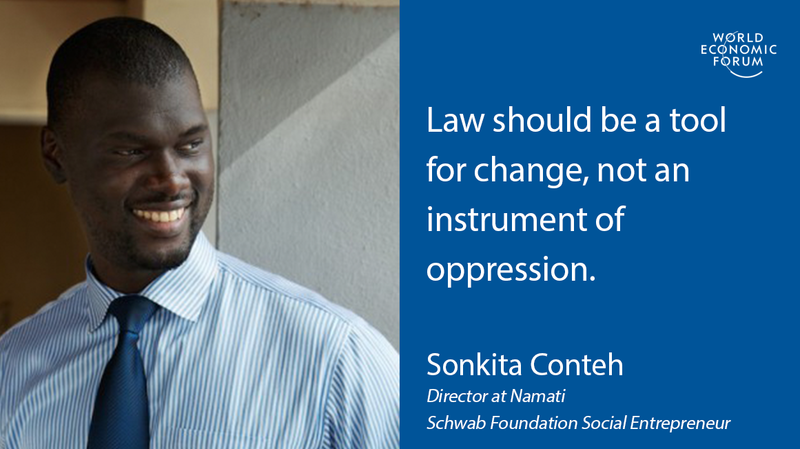 “Law should be a tool for change, not an instrument of oppression. The more people know and use it, the less afraid they become," said Sonkita. Vivek added: "We won’t overcome any of the big challenges we face if our laws and systems only work for the most powerful." Nga Tuyet Trang and Gregory Dajer, Medical Technology Transfer and Services (MTTS), Vietnam. Newborn babies shouldn’t die of cold or jaundice. But the technology that is readily available in the West - such as baby-warmers for premature or sick newborns - is inaccessible to millions of people in poorer parts of the world. MTTS produces medical devices for newborns that are as little as an eighth of the cost of western models, reaching 1.3 million babies in Asia and Africa last year. “I grew up in Vietnam right after the war where almost everything was in short supply including access to basic healthcare. I wanted to make a difference,” said Nga. Yves Moury, Fundación Capital , Colombia/Panama. More than two billion of the poorest people in the world have little or no access to a bank account. Fundación Capital facilitates partnerships between governments and financial institutions to provide inclusive financial services and social programs. It reached over 5 million people in 2016. “Poverty will not disappear with handouts: we need to work together to change the system and build economic citizenship,” Yves said. Eleanor Allen, Water For People , USA . Everyone needs access to water. But 1.8 billion people don’t have it. Water For People works with governments to scale up water and sanitation services. Over the next five years, its ‘Everyone Forever’ model aims to raise the number of people it helps access water from 4 million to 40 million. “Water changes everything. It lays the foundation for health, education and economic prosperity. That is social progress,” Eleanor said. Kimbal Musk, The Kitchen , USA . The Kitchen is a group of affordable restaurants selling healthy, local food that wants to start a revolution in western food culture. “The industrial food system is designed to give us highly calorie, low-nutrition food. This food leaves us malnourished and obese – we are literally fat and starving at the same time,” said Kimbal Musk. Christopher and David Mikkelsen, REFUNITE , Denmark. Refugees often lose everything when they flee - including their families. REFUNITE has built a platform accessible via any basic phone that is free of charge, allowing refugees can search for missing family members. Today, REFUNITE registers 170,000 refugees per year and has reconnected more than 38,000 family members to date. Toby Norman, Simprints , UK . Some 1.5 billion people in the world do not exist, officially. A lack of official ID is a major barrier to accessing services, and it entrenches poverty. Simprints has developed an affordable, secure open-source fingerprint system that is four times cheaper and 228% more accurate than existing biometric tools. “We are working to create a world in which every person counts,” said Toby. Dr. Dale Lewis, COMACO , Zambia . If farmers could make a decent living, poaching would decline. That’s the theory behind COMACO, which has virtually eradicated poaching across a million hectares by giving farmers education and access to premium markets for products like peanut butter, rice and honey. To date, COMACO has registered 140,000 farmers committed to conservation farming practices and wildlife preservation. Neichute Doulo, Entreprenuers Associates , India . Entrepreneurs Associates supports a new generation of entrepreneurs in the politically turbulent and economically disadvantaged northeastern region of India. "Anyone can be an entrepreneur. The hallmark of a social entrepreneur lies in taking society forward as part of one’s own success," Neichute said. Malik Ahmad Jalal and Fayeeza Naqvi, The Aman Foundation , Pakistan . The Aman Foundation provides ambulances, health centres and education to fill unmet needs in fast-growing Pakistani cities. Its ambulances attend 100,000 cases a year, 60% of which are road accidents handled free of charge. It is working with the local Government of Sindh to expand to 450,000 cases a year. The Aman Foundation also provides vocational skills training programmes for young people in violence-prone areas. Carlos Edmar Pereira, Livox , Brazil . In Brazil, 15 million people struggle to communicate because of disabilities or illness, from strokes to cerebral palsy. Livox created an app that uses intelligent algorithms to interpret a user’s finger movements, allowing disabled people to communicate and study. Carlos’s daughter has cerebral palsy, providing the impetus for his work.